Hey, it's only taken me until February to make my first blog post of the year! To make up for the long gap, I'm presenting a new Disturbing Library Find! 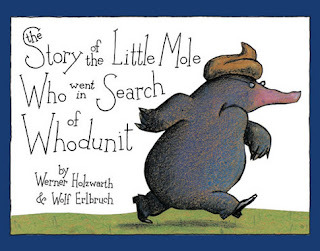 Yes, the adorable little tale of an adorable little mole in adorable search of "whodunit". That "hat" on his head? It is what you think it is. A co-worker originally found this in its original German format and passed it on to me, thinking it ideal for Disturbing Library Finds. He was right. Everyone I show this book to, whether in German or the above-pictured English translation, tends to sit with their mouth gaping open in disbelief. The little mole pops his head out of his hole one morning and, yes, suddenly has crap land on his head. Understandably pissed off about this, he goes from animal to animal, asking if they are the perpetrator. On each double-page spread, each animal proves their innocence by letting go with their own, unique feces. There are thuds and splats all over the place. Wherever these animals all dwell together is obviously to be avoided if you care about your footwear at all. I won't spoil the ending for you by revealing "whodunit" but I will let you know that the mole clearly believes in "an eye for an eye" and gives as good as he gets. Posted by Doug A Scott at 4:51 p.m. If it hadn't been for your interest in questionable publishing I would never have gotten a joke concerning this book in the penultimate episode of The Vicar of Dibley. Upon meeting the Gorgeous New Man in the village Alice the verger lists "The Story of the Little Mole Who Knew It Was None of His Business" as one of her favorite books. I knew immediately this must be the UK title of this book and sure enough, it is. February 6, 2008 at 6:31 a.m.